A few more days of rain are expected before a long-awaited drier pattern emerges. At this time, additional rainfall amounts look to be manageable. Today and Tonight: Despite a front being stalled along the Louisiana Coast, dry conditions will persist through most of New Year's Day, with only a spotty shower possible, mainly south of the highways. Some sun is possible—especially north and west of Baton Rouge. Temperatures will be cooler than Monday with highs in the mid 60s. Overnight, clouds will tend to thicken with lows in the mid 50s. Up Next: Yet another front will journey into our region Wednesday and Thursday with another round of light to moderate rain. Amounts should stay below an inch or so through that time so no additional flood concerns are expected. The temperature forecast through this time is very difficult thanks to the area being caught between two boundaries. High pressure will build into the region on Friday beginning a much needed sunny and dry stretch with gradually moderating temperatures. A cold front will stall along the Louisiana Coast presenting a challenging temperature forecast through mid-week. While much of the area will notice cooling as the front settles south, the boundary will become more diffuse, possibly allowing some warmer air to retreat north. Temperatures have been blended with forecast model guidance but confidence is poor. Due to overrunning processes, stratiform clouds will persist across the southern half of the forecast area through much of the day. Some clearing may occur in northern and western sections of the region. Overnight, an area of low pressure will develop along the tail end of this front near the Texas Coast. Forecast models bring another round of rain across the area from Wednesday into Thursday. 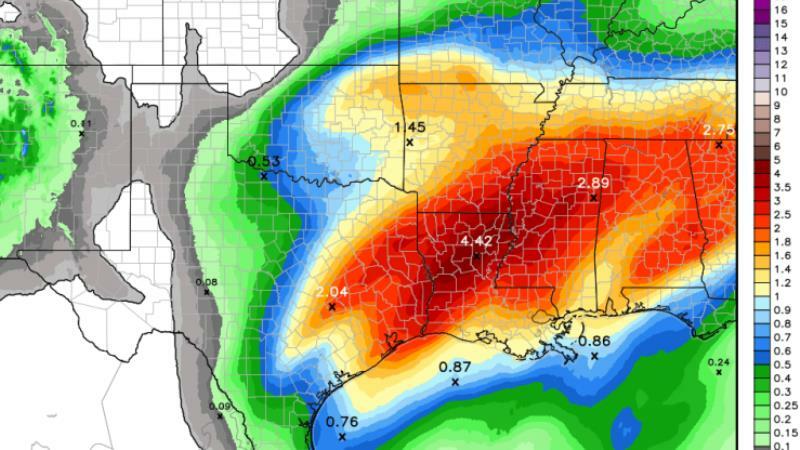 This final storm system in succession looks to bring manageable rainfall amounts at this time but the Weather Prediction Center highlights areas just north of our 13 Parishes and 3 Counties for an additional 2-3 inches of rain. Should this axis shift farther south, flood concerns may increase due to already saturated grounds. Significant drying will come by the end of the week as the associated cold front crosses. Colder and drier air will settle into the region for the weekend.